I am a huge appetizer fan and usually love to serve a variety whenever I have dinner parties or friends over for chai. On one such occasion, I served this crunchy on the outside and soft on the inside tikki. 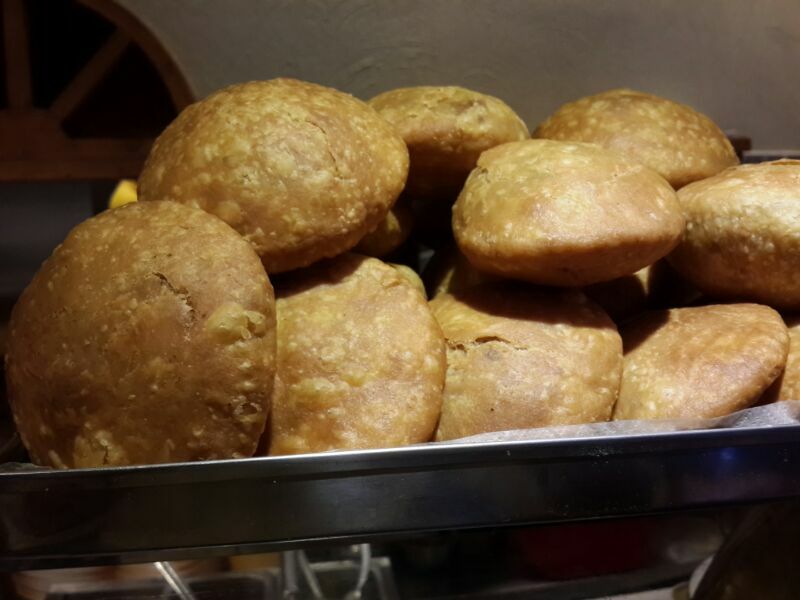 Patties, cutlets or tikkis are a staple snack in Northen parts of India. Aloo Tikki is mostly featured in the appetiser section in most Indian eateries and serves as a base for many chaat items. Move up towards western India and Mumbai has aloo tikki’s popular cousin Ragda Pattice. The spicy chutneys the tikkis are usually served with make it a medley of flavours. Sweet, tangy, spicy and crunchy what more would you need! These are fairly quick to assemble and make and perfect way to use up leftover boiled potatoes. Since I wanted to feel less guilty, I added some oats and vegetables to them. Adding oats also helped up the crunch factor in the tikkis. Grind the oats. In a bowl, add all the ingredients and mix them well. Now with greased hands, make 12 equal portions and roll out in flat tikki (cutlet) shape. Dust them in a plate with equal portions of ground oats and breadcrumbs. Shallow fry on each side until they acquire a even brown color. Serve immediately with coriander mint chutney. Let me know if you liked this recipe and any variations I can try the next time. We discussed how the average Mumbaikar’s idea of a good monsoon outing is visiting Juhu beach, eating gola, also known as chuski or shaved ice on a stick submerged in flavored food colored water and downing plates of bhel puri, dahi batata puri and of course the iconic Juhu beach Pav Bhaji. We got nostalgic about our picnics there when I was a kid, the scary fall I had when horse riding or making sand castles. They were good fun times! If you visit Mumbai, it is an important to-do in travel iternarary. Over the years the place has been very crowded and now it’s been many years I have not visited Juhu beach. I prefer Worli Seaface instead for the quiet there and listening to the waves! 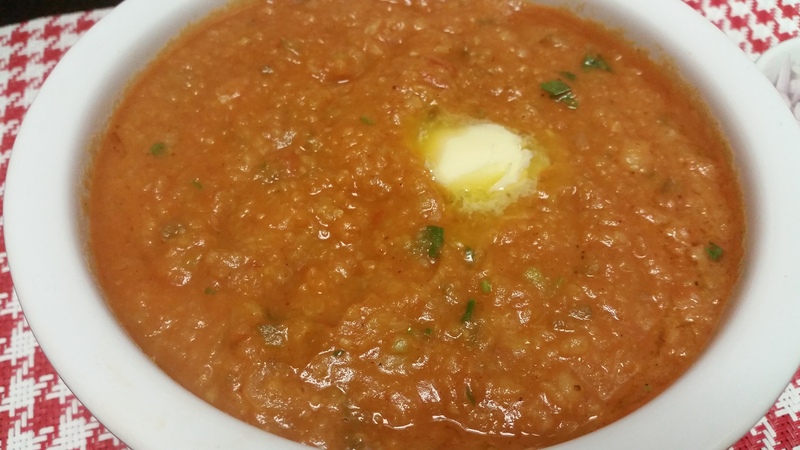 Below is my take on the Pav Bhaji! In a pressure cooker, boil the potatoes in salted water. Once cooled, mash them with a potato masher or with a fork. Set it aside. In a pot, blanch caulifower florets and peas and give them a cold bath once out. In a food processor, just blend them together to bread crumb consistency. Do not add any water to the blender. Set it aside. 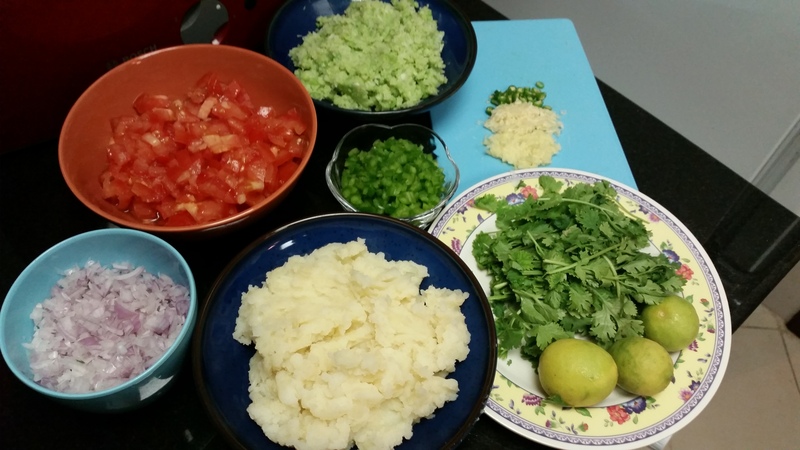 The key to making great pay bhaji is being sorted with the prep beforehand. The dish comes together quickly this way. Traditionally, bhaji is cooked on a flat disc shaped iron tawa (griddle) but I had to do with a humble kadhai in my rental kitchen. 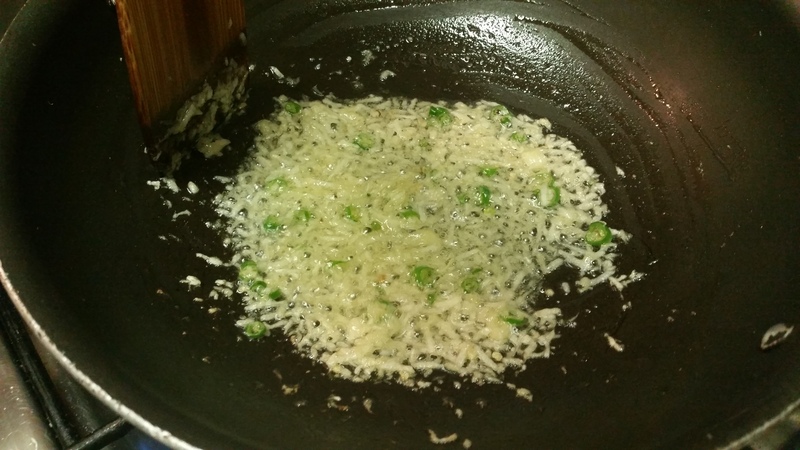 In a kadhai, heat some oil and add green chillies. 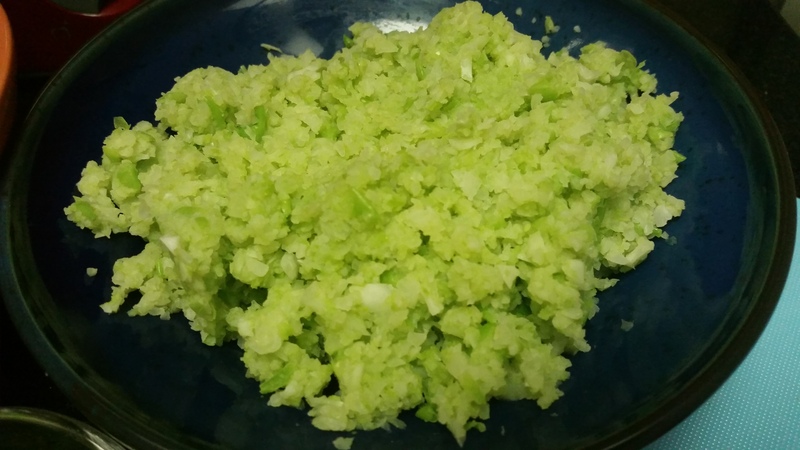 Once it sizzles, add the ginger and garlic followed by the onions and cook them until they are translucent. 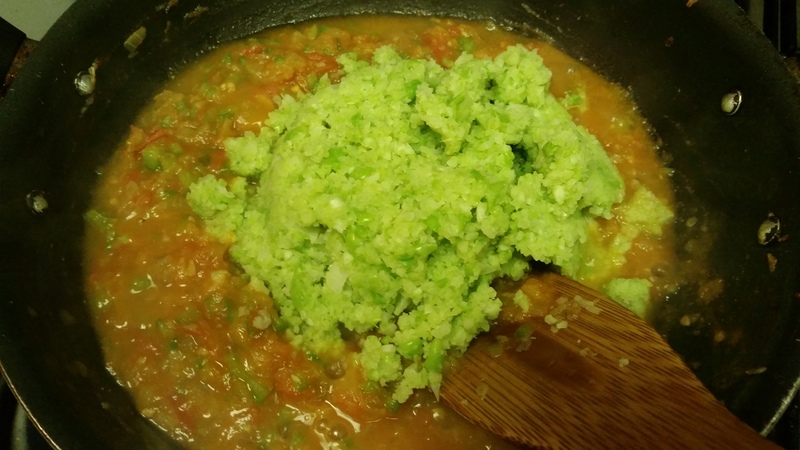 Please note traditionally not many people use green chillies in the pav bhaji and use red chill paste instead. I did not have red chillies on hand and hence went for green chillies. To the onions, add tomatoes and cook for a few minutes. Once mushy, add tomato paste, it lends a good consistency to the mix and also gives a deep red color. Cook them well. 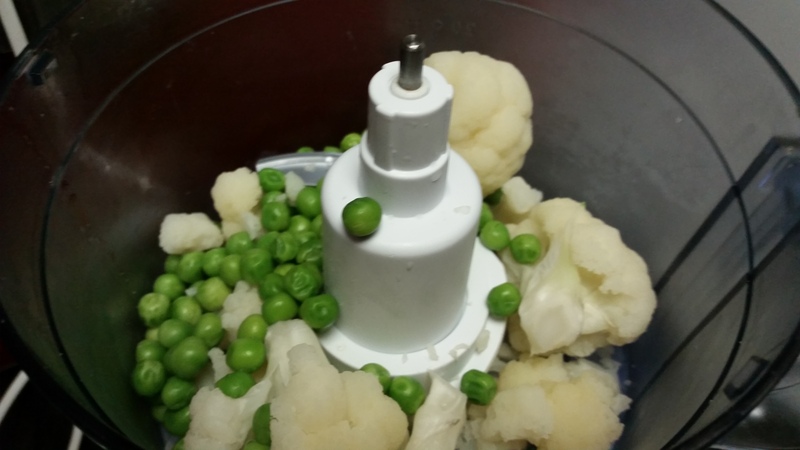 Add chopped capsicum, sautee for a while and add the cauliflower and peas to the mixture. 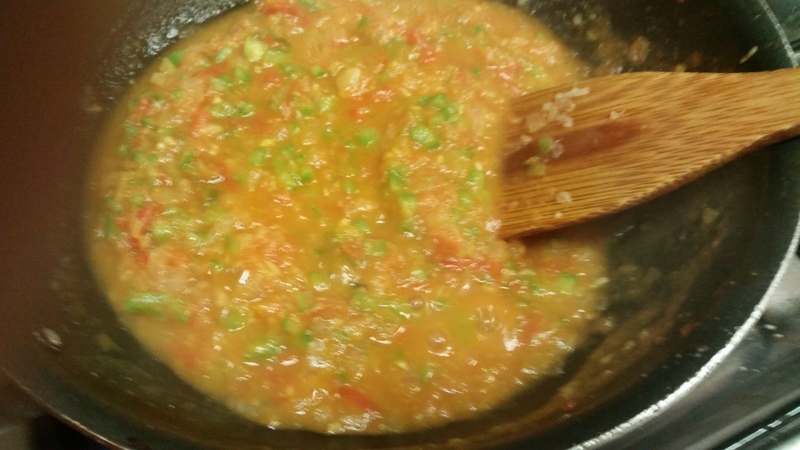 Add pav bhaji masala, coriander powder, red chilly powder, turmeric and salt to taste. Blend the ingredients well with some water. Add mashed potato to the mixture and mix well. Keep adding water to the mixture as required. Add dollops of butter and season well with salt, let it simmer for a while. Usually I use Lurpark or Ellie & Vier butter but for pav bhaji I bring out Amul butter. 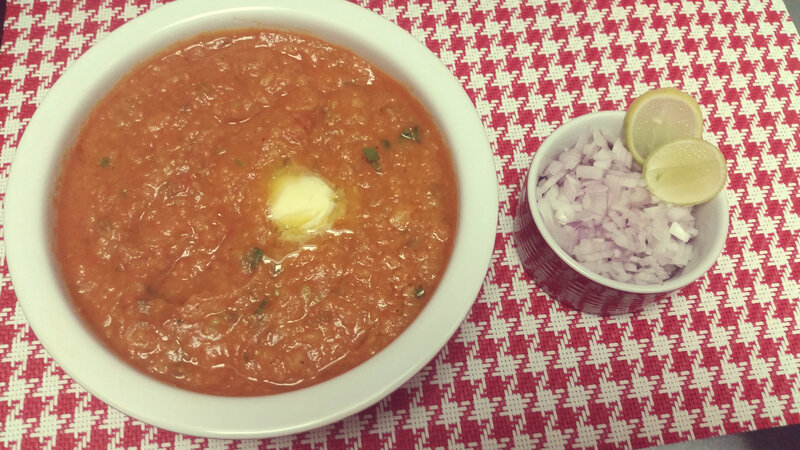 Amul butter is just synonymous with Juhu beach style pav bhaji and is like a staple ingredient in every kitchen when making pav bhaji or maybe just me! Garnish with freshly chopped coriander leaves and some more butter. 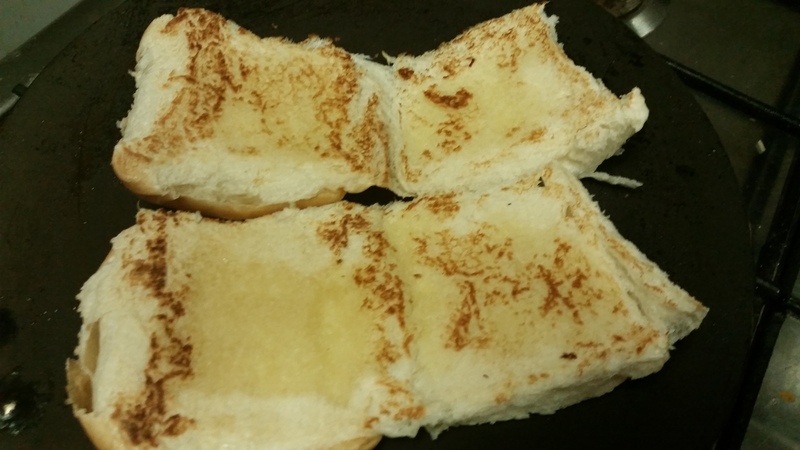 To have the pav with the bhaji, on a tawa just add butter and roast the pav in the buttery goodness for a few minutes until they have evenly browned. You can buy good pav at the bakery section of Lulu or even try the portuguese rolls available at Waitrose. 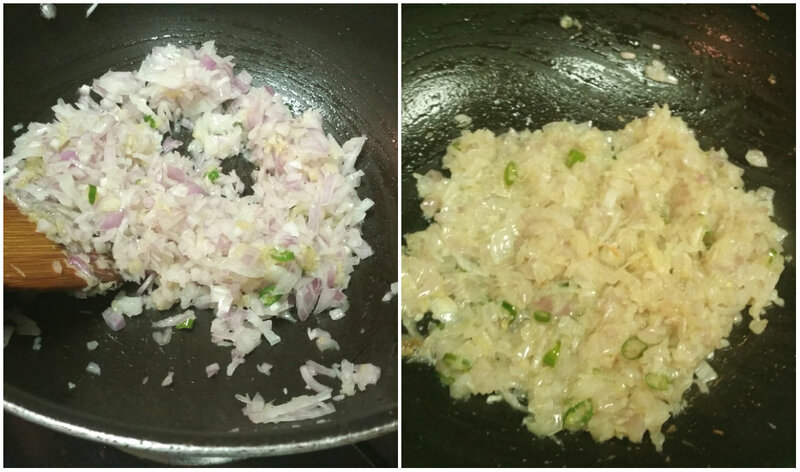 Serve with dollops of butter on the side, lemon wedges and finely chopped onion. Throwing in a get together can be exhausting especially when you are clocking in a 10 hour work days and have a crowd to feed and every one has a very specific palette. A little planning goes a long way and making a to-do list for all the prep can ease off any anxiety. I threw a Holi dinner party for my newly wed brother-in-law and the extended family. 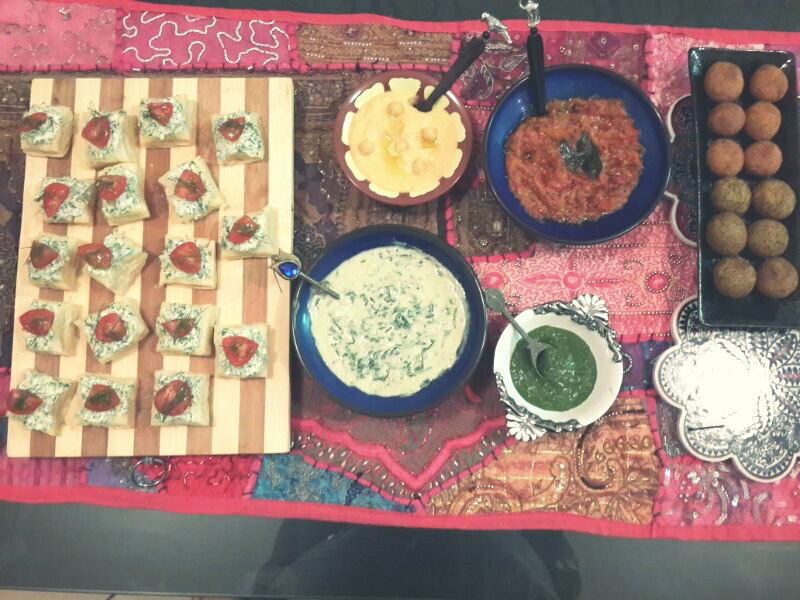 Now this is a traditional Punjabi family set up and while we might be Indo-Chinese style Spring Roll, Momos and Pav Bhaji loving folks, on festivals we like to belong where our roots are and so I braced myself to make an out and out Punjabi feast. I took some liberty to tweak only the starters and appetizers. We thought of bringing in some variety and playing with flavors which are not quite alien to them. My mum-in-law said why not marry a version of palak paneer (spinach & cottage cheese) and chana masala (chickpeas) for them. 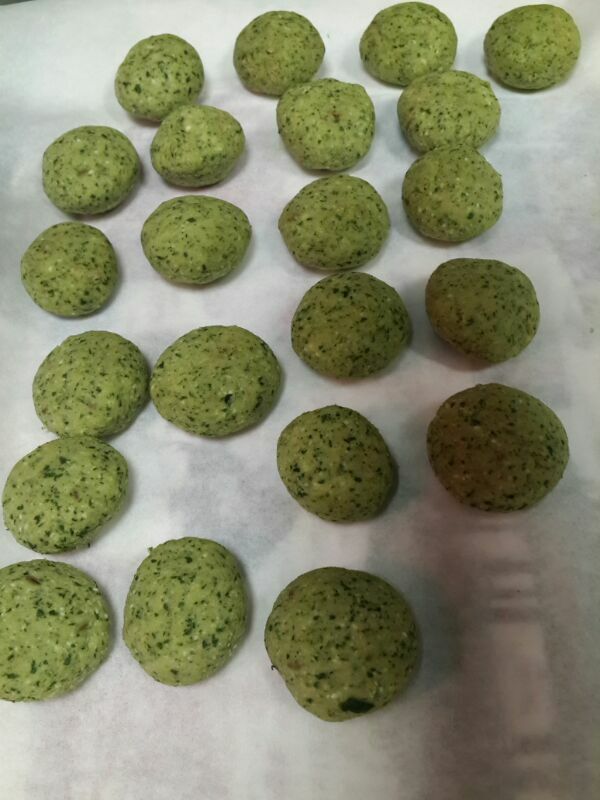 I remembered this recipe for Spinach & Feta Falafel Balls from BBC Good Food website and adapted the same to my family’s liking. The result was great! Two recipes which I would keep handy for future get togethers will be this one and my Spicy Peanut Balls recipe served with Tomato Thokku. The textures and flavor combinations are great. The original recipe called for blanching the spinach by poring boiling water over it. I just sautéed the spinach with onions just until it was soft. In a food processor, add the onion spinach mixture along with the chickpeas. Rinse and pat dry the chickpeas to avoid more moisture in the mix. Add cottage cheese, coriander leaves, roasted cumin powder, coriander powder, chat masala, green chilly and salt to taste and pulse well. Once the mixture is grainy, add flour and breadcrumbs and blend well. Remove from the food processor, grease your hands and make roll bite sized balls. Deep fry over medium heat until they have a pretty brown color. I really wish that I had some pictures for this post. Serve with tzatziki and hummus. I love eating street food and the mere mention makes me go weak in my knees! Such is my fascination with chaat vendors that I should be given the most loyal customer award for visiting Elco, Bandra Mumbai traveling to the other side of the city just to eat the pani puri and papdi chaat. I find very limited good chaat houses in Dubai unlike India wherein there is one in every corner of the street. I came to know about Chatori Gali in Al Barsha via Twitter. Some one strongly suggested that I visit them for their jalebis. 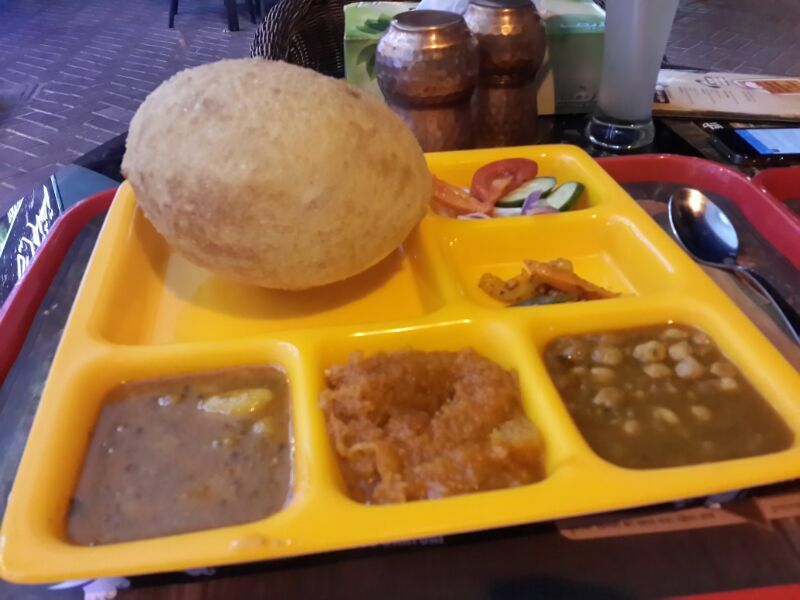 This is a relatively small dining place just behind Mall of Emirates and a stone’s throw away from Bikanervala which is more popular in the area. Just a disclaimer, I have tried these dishes reviewed over 5 visits and found them to be consistent. I started by trying the Gol Gappe (Delhi) or Phuchkas (Bengal) or Pani Puri (Mumbai). It is hollow fried crisps filled with a sprouts / potato mixture and downed with flavored water. I wasn’t impressed. It lacked serious amounts of masalas and that “ahhaa” factor. We next moved on to try Raj Kachori, deep fried round flattened ball filled with a stuffing of lentils, cubed potatoes, sprouts, well beaten yoghurt and chutneys and garnished with sev. 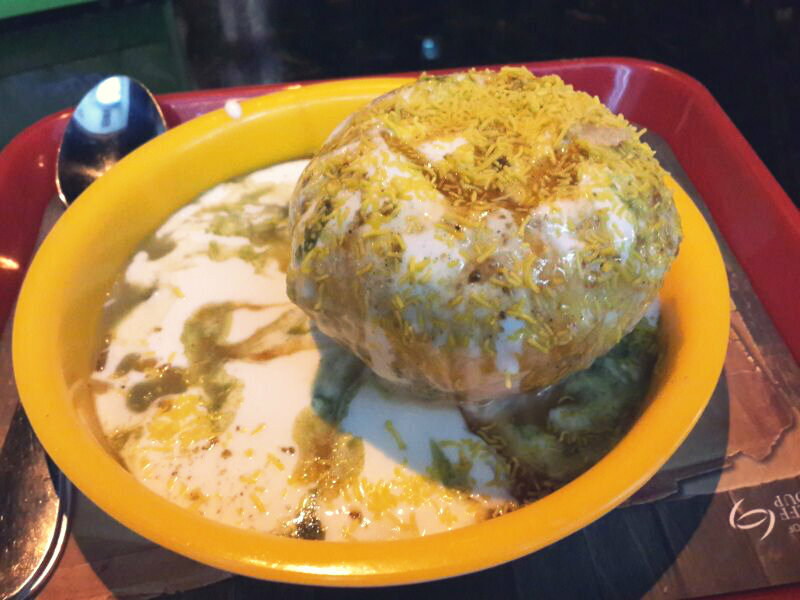 The Kachori in itself was quite dried out and hence not crisp and was overloaded with yoghurt. There was very minuscule amounts of stuffing and hence it was another ‘No’ for me. On a side note, the Pyaaz Kachori (Onion stuffed) was great in comparison. We also tried Ram Ladoo, a popular snacking dish in North India. 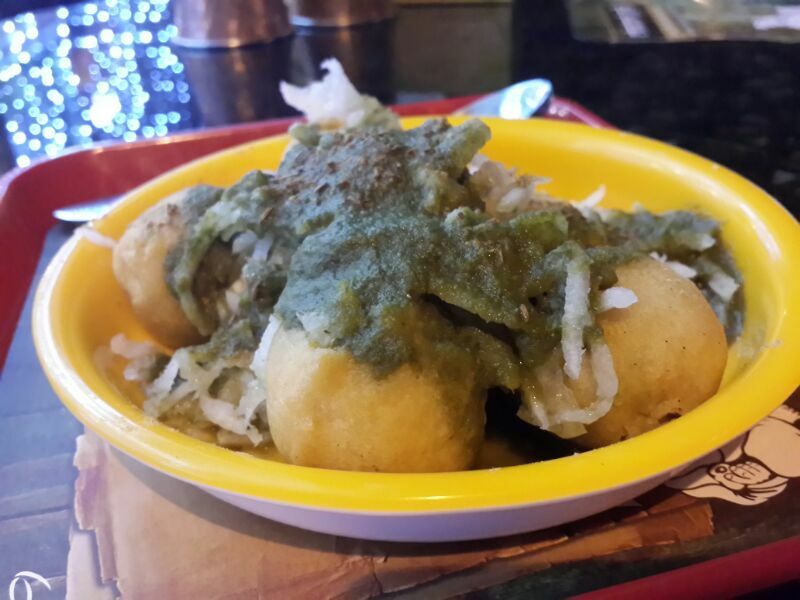 These are deep fried moong dal (split green gram skinless) and urad dal (split green gram skinless) balls served with spicy tangy green chutneys garnished with grated raddish. It was average and needed to be soaked in the chutney before serving them. That’s how it’s traditionally served, maybe I had high expectations! The best memories I have had of Ram Ladoo are in my teens when I visited Amritsar and ate them at a small time vendor. He soaked them in Kanji, a popular Punjabi fermented drink made with red carrots, turnips, beets spiced up with rock salt, red chilly powder and mustard powder. He later topped them with spicy hot green chutney and radish! Drool worthy! Moving on to the review, we proceeded to order Bread Pakoda, now this won me over completely. Bread slices sandwiched with a spicy mashed potato mixture coated in chickpea flour batter and deep fried. It had a generous sprinkling of chaat masala. It was served to us piping hot and with a side of coriander and tamarind chutneys. We tried Samosa Chaat, it was delicious. They served the samosa piping hot and were quite generous with the chutneys (thank goodness! ), as a result, me and my guests were vying to get the last bite. Gluttony! On another visit we tried “Parathe wali Galli ke Parathe” this immediately took me back to the bylines of Old Delhi in Chandni Chowk where Sahil first took me for a date many years back shortly after we visited the magnificent Jama Masjid. For old time sake, we ordered the Parathas, you can choose two from the various varieties of parathas available. We ordered aloo pyaaz (Flat bread stuffed with spicy boiled potato and onions mix) and Gobhi (Cauliflower stuffing). Usually parathas are cooked on a tawa (flat griddle) but this particular type of parathas are deep fried in a wok. The parathas are served with Chole (spicy and tangy chickpea curry), Kaddu Ki Launji (Pumpkin cooked downed with spices and mildly sweet), Aloo Sabzi (Potato cubes in onion tomato gravy), Mixed cauliflower and carrot pickle smeared with mustard powder, a few pieces of tomato and cucumber and sweet chutney. Unfortunately since we have ordered this twice, I can’t seem to find the picture with Kaddu ki Launji. I loved the Aloo Sabzi, it was quite spicy but I savoured every morsel of the paratha dipped in the sabzi. Yumm! As for the parathas, I could not have beyond one piece. The parathas were crisp on the outside but all that deep frying made them too heavy. We moved on to Bedami Aloo. 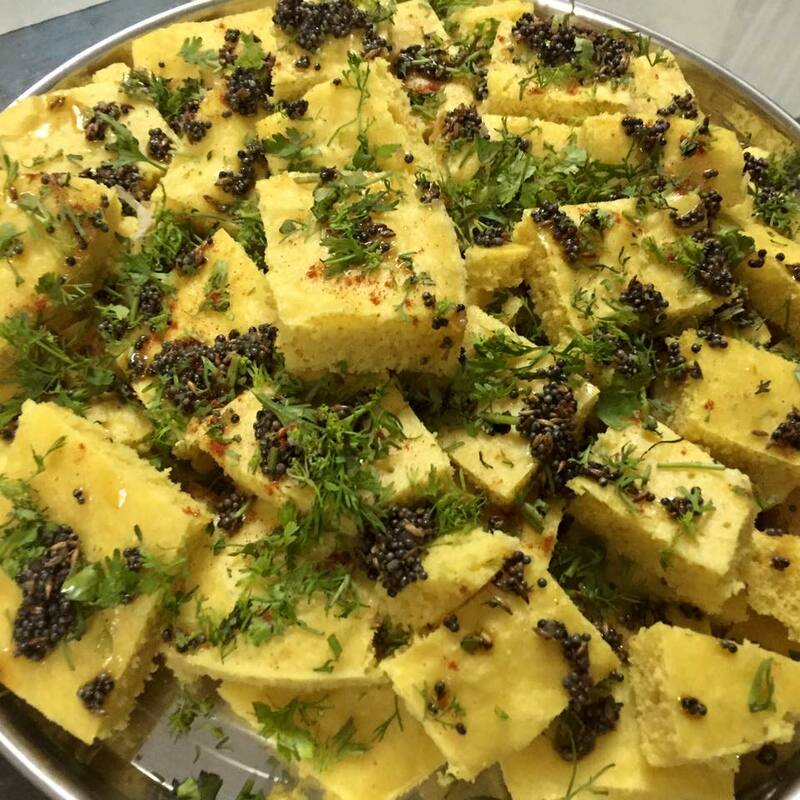 Bedmi is an another popular breakfast option served in Chandni Chowk and Old Delhi. It is a puri (deep fried puffed bread) made with wheat flour and ground lentils, either skinned black gram dal or green gram dal. The accompaniments which come along with the Bedami Puri are same as the parathas. We were keen on having it only with the Aloo sabzi and asked to be served the same instead of the Chole and Kaddu Ki Launji. Again great dish and a must try once you visit this place. 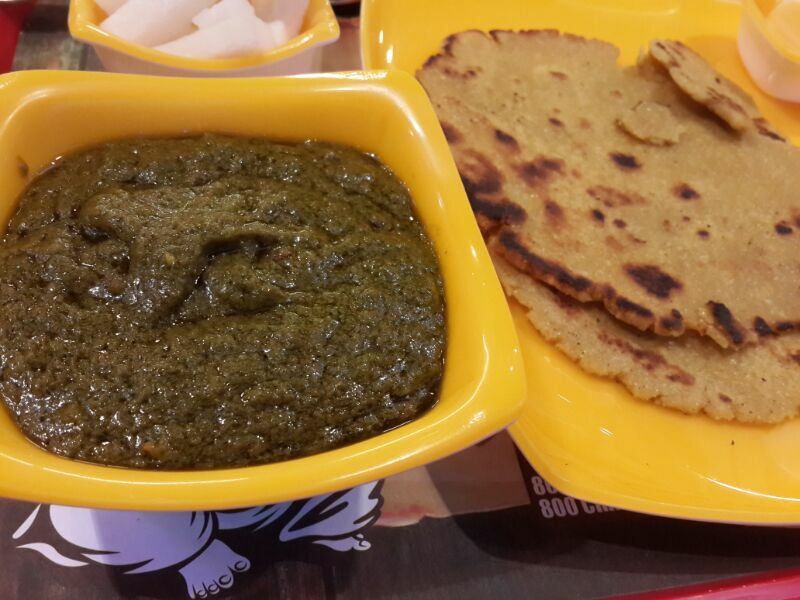 We also ordered Sarson Ka Saag with Makke Ki Roti. Sarson ka Saag is mustard leaves and spinach leaves cooked with spices in and usually mustard oil. Makke ki Roti is flatbread made with maize flour, easily available in Indian grocery stores here. It was delicious and was served with a side of jaggery and raddish. If you are looking for a lighter option than the parathas then you can also opt for the various menu options like Methi Roti, Gobhi Roti or Missi Roti. 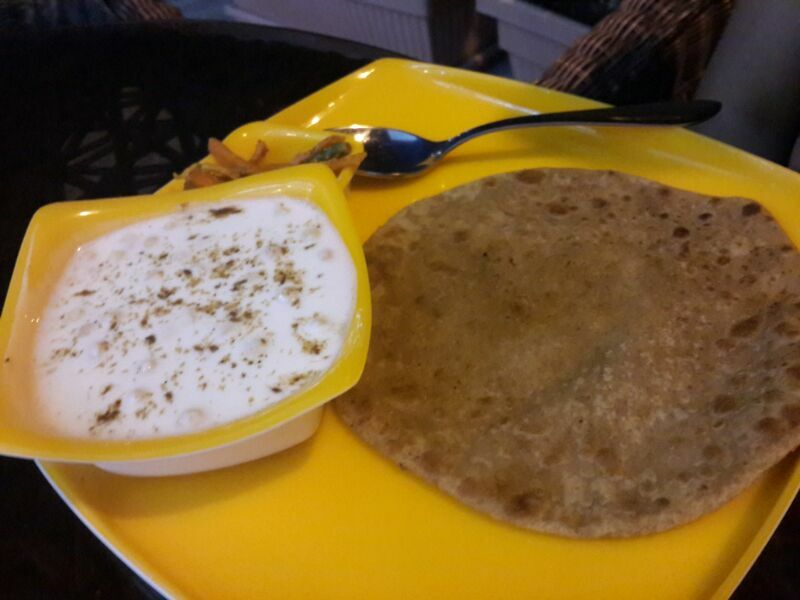 I chose Tawa Paratha (Wholewheat flatbread cooked on a disc shaped griddle) with Boondi Raita. Simple home style dinner option. 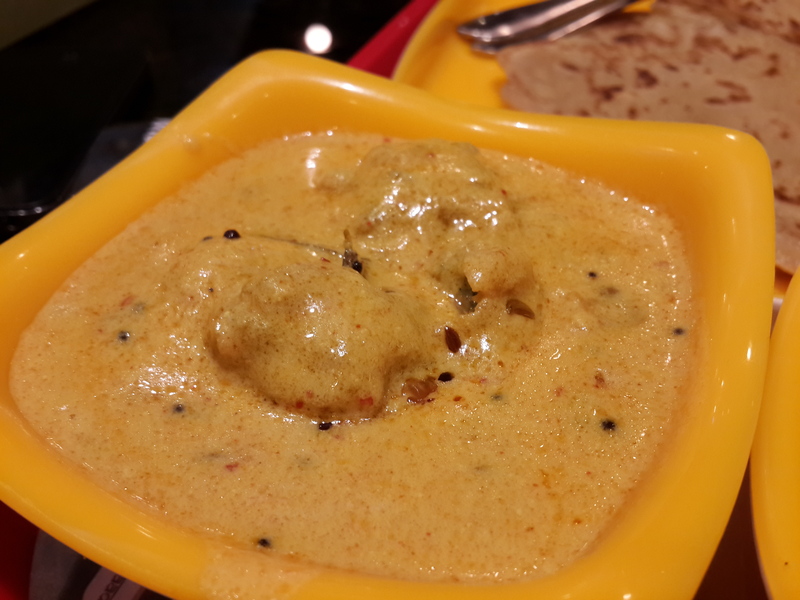 I tried the parathas with Raita and once with Kadhi Pakoda, it was simply delish. The Kadhi was punjabi style, buttermilk cooked with gram flour, mustard seeds, fenugreek seeds, cumin seeds and red chilly powder. 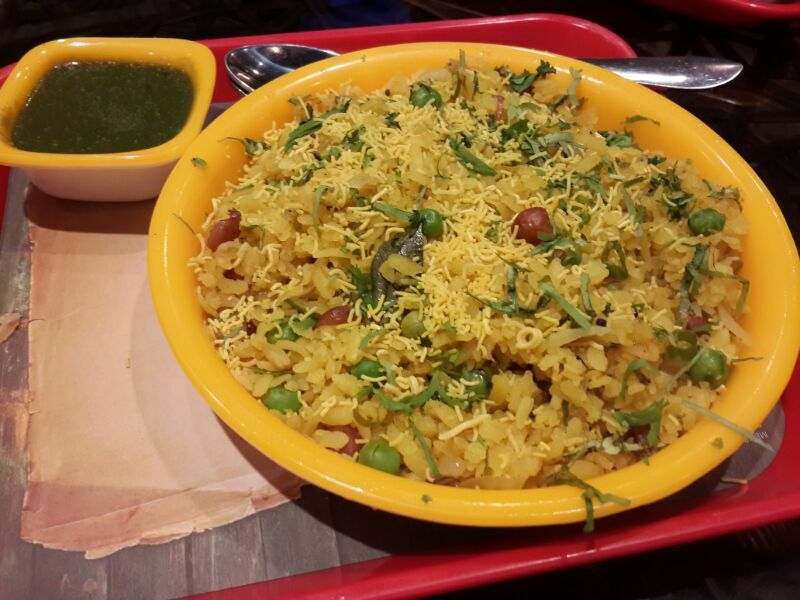 We also tried Poha, it was a nice light snack. Poha is flattened wife flakes cooked with onions, peas, mustard seeds and garnished with peanuts, coriander leaves and Sev (Savoury Gramflour Vermicelli). It was just good to be had with a side of masala chai. The tea served at Chatori Gali is prepared fresh and they use Lipton tea bags for the same however I did skip this on my subsequent visits. I don’t blame them, I’m quite picky about the masala chai I have. Sahil tried Thandai, it is a chilled drink made from milk, ground dry fruits flavored with kewda, rosewater, saffron, sugar and fennel seeds. This one was made with store bought syrup and sparingly topped with almond flakes. He found it quite refreshing. 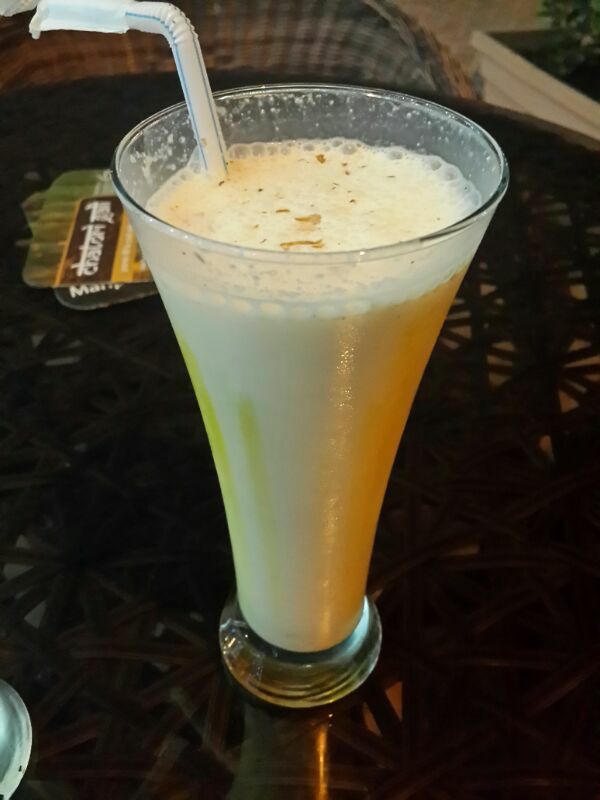 Their drinks menu also has fresh juices, Kanji, Fresh Lemonade, Lassi and Milkshakes. 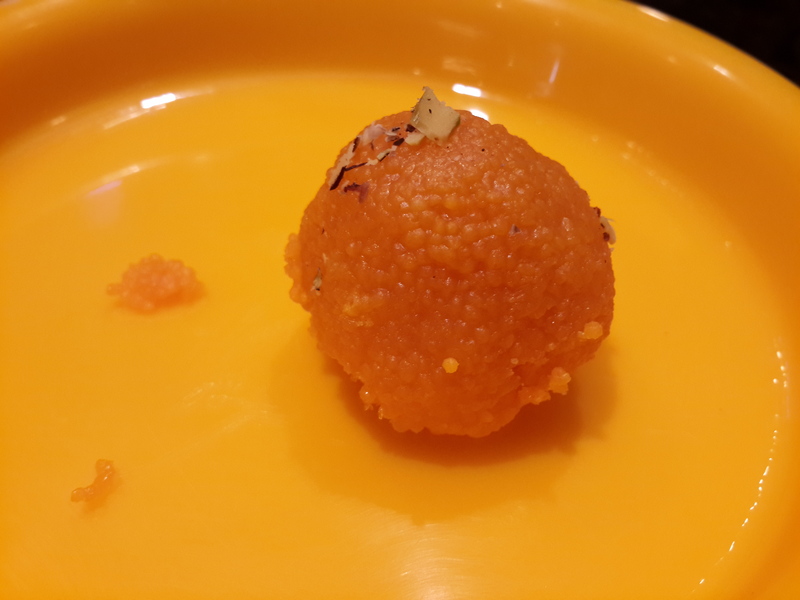 In desserts, we tried the Motichoor Ladoo, it was quite dry and not good enough. It was crispy, crunchy and supremely heavenly. It tasted divine and was just the thing you need to taste on a day when you feel under weather. 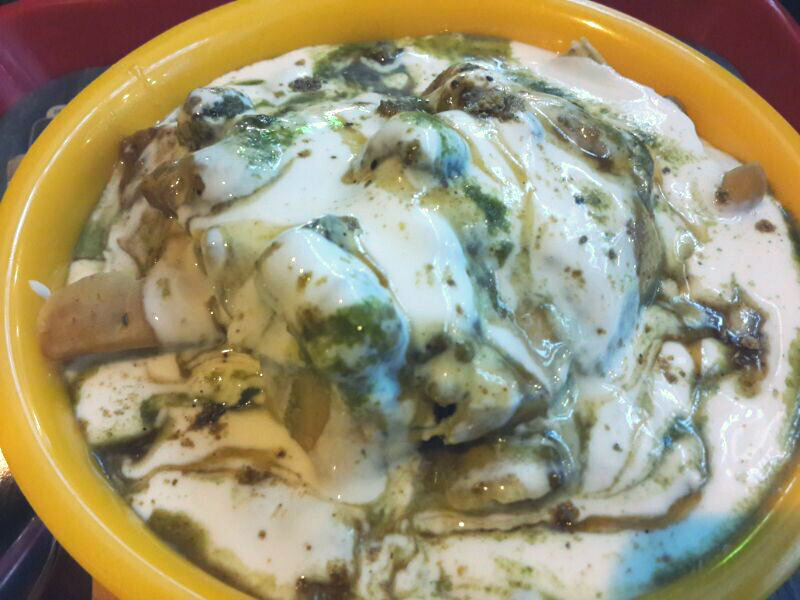 When dipped in the Rabdi, it is a killer combination! 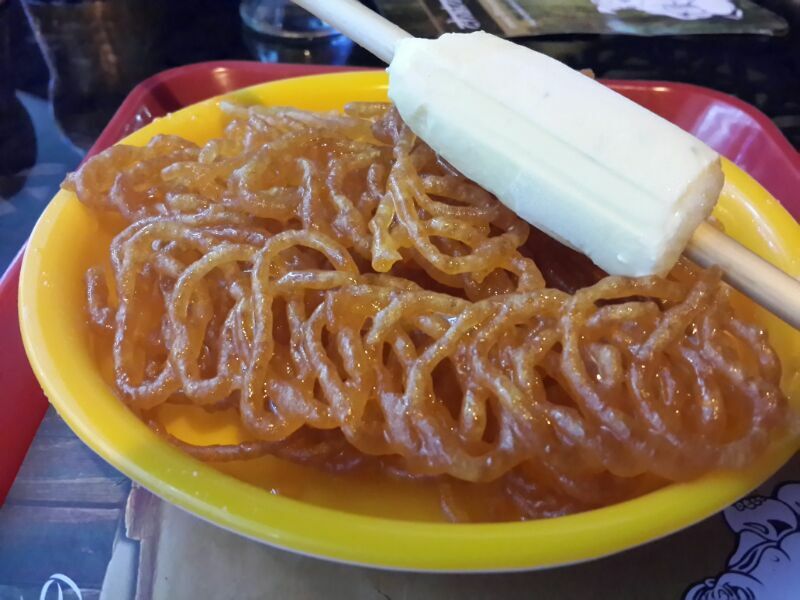 We however had the piping hot jalebis with their stick kulfi. The kulfi was quite creamy and not too sweet and good way to end a hearty meal. 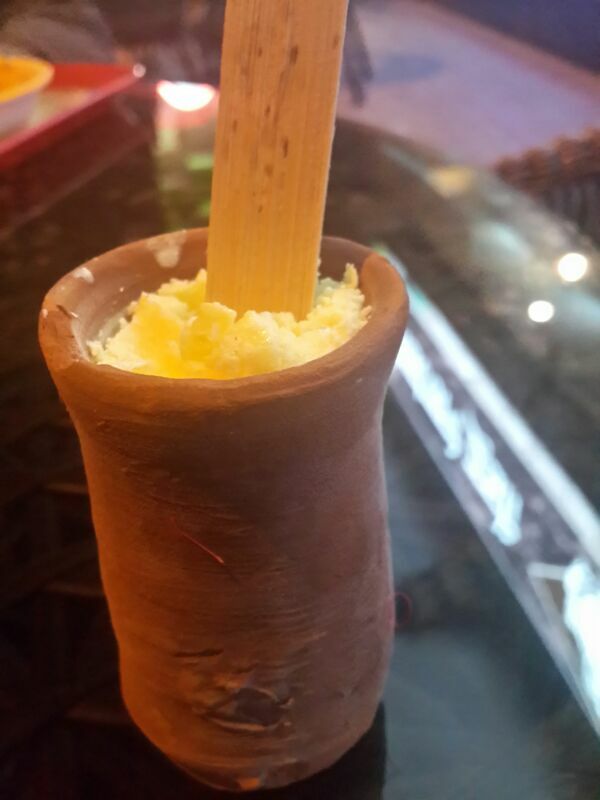 The Matka Kulfi was pretty looking in the earthen pot but did not taste as great as the Stick Kulfi. 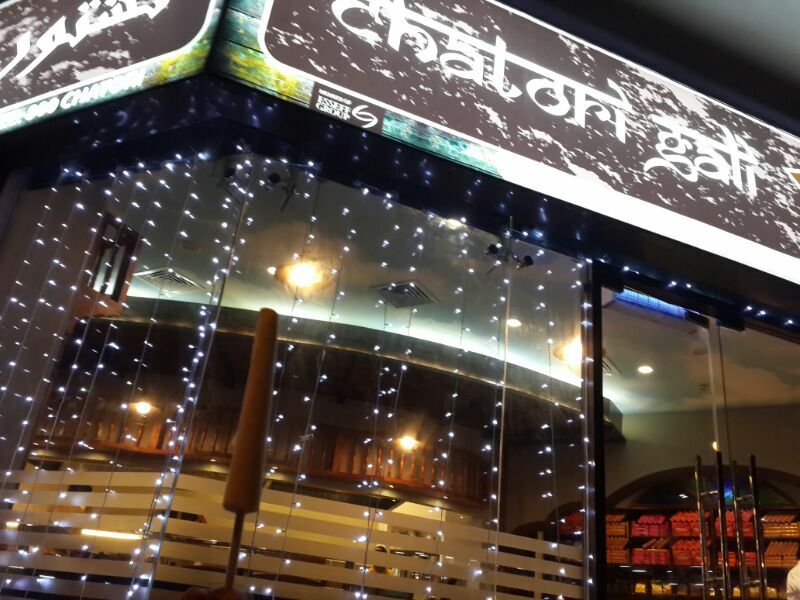 Visit Chatori Galli with a big appetite, the service is quite off sometimes mainly due to how busy the place is in evenings. However we have found a friend in Sandeep, a great guy who takes pleasure in serving you well. Disclaimer : All featured dishes and meals were paid for my me and this post is not a sponsored one.